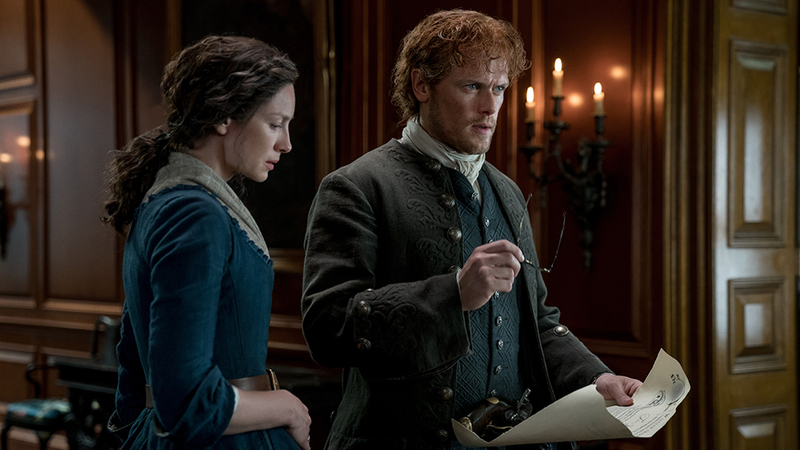 Outlander's uneven fourth run wraps things up with a promising tease for what's to come. Hands up if Lord John is your new favourite character in Outlander. Hands up if you didn’t expect yourself to be saying that after Season 4 of Outlander. And hands up once more if that’s a bit weird in a series that isn’t meant to be about Lord John at all. That you’ve now got three hands in the air is an indication of some of the problems with the fourth run of STARZ’s fantasy time-travel romance, and its final two chapters work hard to resolve them, but can’t help but underline them all the same. 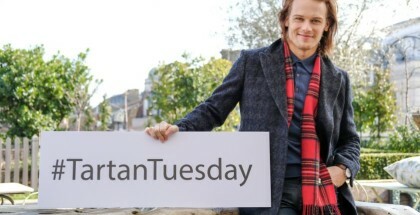 But first, Lord John (David Berry), who, you may recall, has agreed to get engaged to Brianna, partly because she blackmailed him into taking her off the market and partly because he wanted to help look after the daughter of Jamie – and with Berry’s extremely earnest performance, it’s hard not to sympathise with both. Especially because he never seems to show anything other than the purest of motivations: when Brianna hears that Stephen has been incarcerated in Wilmington prison, she demands that they go to see him, and he, after expressing his concerns, goes with her, not intruding, imposing or undermining – but simultaneously being on hand for any assistance needed. The confrontation goes as you’d expect, with Brianna telling Stephen exactly what he deserves to hear – namely, that he’ll have a baby in the world once he’s executed, which might provide him some comfort, and that she forgives him, but also, that he’ll never get to see said baby and she’ll never give him another second’s thought from now on. That fiery exchange literally sparks into flame when Fergus turns up at the prison to break out Murtagh – who, inevitably, has been locked up in the same jail – and, of course, they immediately set about blowing up the whole thing. Does Stephen escape from the keys that land near his cell during the kerfuffle? That’s a question for Season 5, but there’s more fun to be had elsewhere, as Lord John and Murtagh cross paths – and he, of course, disapproves entirely of the whole escape plan. 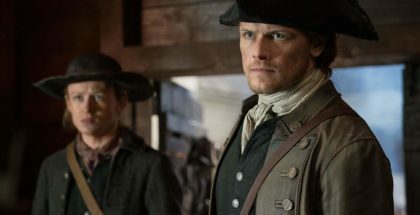 But, as Jamie’s friend and Brianna’s husband-to-be, he isn’t about to break ranks, and so he escorts Brianna away calmly and quickly, lying to the officers that stop them to cover Murtagh’s escape. All of this is fine and dandy, primarily because of Berry’s presence, but that entertainment goes right down the drain when we catch up with Roger (Richard Rankin), who’s also being kept captive by the Mohawks. There, he starts talking to fellow prisoner Alexandre, a priest who ended up becoming a father with Johiehon, a member of the tribe – but when asked to baptise the baby, he refused, as he felt that he had fallen from grace and would only condemn the child by carrying out the ritual. As a result, he’s sentenced to being burned to death – and, because this is Outlander, we have to see that death happen, after Roger tries (and fails) to convince Alexandre to compromise. Roger escapes, finally, but as he makes his way to freedom, he sees the execution happening slowly and painfully – and so he races back to throw something on the fire to speed it up. At which point Johiehon runs to join Alexandre on the pyre too. It’s a grim, unnecessary sequence, one that doesn’t teach us anything new about Roger as a character. It’s testament to how wayward this segment of the season feels – Outlander, Roger and Brianna prove (through no fault of the actors), works best when Jamie and Claire are at its core – that this only comes across as an attempt to remind how nice Roger is really. That feeling doesn’t go away come the finale, which wraps up this whole sequence by Jamie, Clare and Young Ian rocking up at the Mohawk settlement. Their plan is to trade some goods for Roger, but the whole tribe freak out when they see the pendant that Claire is wearing – the stone that came from the old man/skull that Claire encountered earlier in the season (remember that?). That stone, we learn, belonged to Old Tooth, a man who forecast the end of the Mohawks, and judging by the fillings Claire found in his skull, he was a time-traveller too, so maybe he knew something about that after all. Fortunately, after our heroes are kicked out, a rogue band of Mohawk members break away from the settlement to find out more – and they convince them to help them break Roger out of the camp in exchange for the stone. Needless to say, the escape attempt is rumbled, putting them all in a spot of bother (and the rogue band rather unfairly expelled from the tribe). Enter Young Ian, though, who saves the day by volunteering as tribute in Roger’s place – something that the Mohawk agree to. 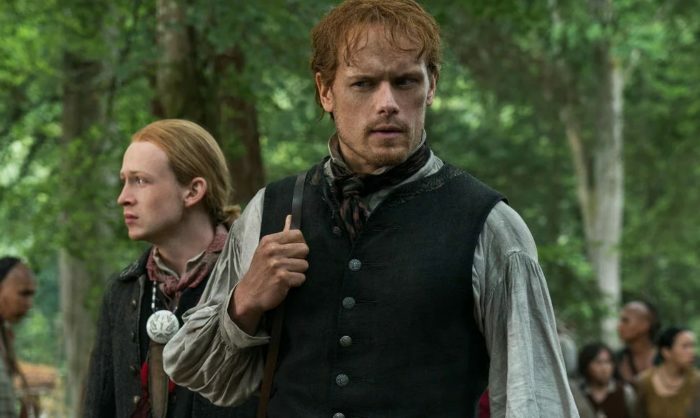 It’s an honourable decision from Young Ian, who was so foolish in his cousinly ways only a couple of episodes before – and Sam Heughan’s reaction, as Jamie has to bid farewell to a pseudo-son figure, makes the whole thing surprisingly moving. Until, of course, you realise that at no point has Roger ever suggested he might just give himself up instead and let them all live without him. But no, Roger doesn’t think like that, and so the gang head back home. On the way, Clare informs him of what happened to Brianna, and he asks for time to think about whether he can love another man’s child, given the circumstances – which, to be frank, isn’t really the response of a man who loves the woman he’s with. Once again, Roger just keeps on coming up short, even when he’s given the rare chance to improve as a character. Luckily, he’s not the only one heading back to see Brianna, which is something that Murtagh’s also doing. And, by “see Brianna”, what we really mean, is “flirt with Aunt Jocasta”, because yes, it’s time for part two of Outlander’s Unlikeliest Couple and, frankly, it’s an absolute joy to see the pair of them fighting over Brianna’s decision to marry Lord John, a Red Coat. Indeed, it’s telling that Murtagh emerges as the focal point for Season 4’s finale, despite the fact that it’s meant to be about Roger returning to reunite with Brianna. He does do that, in the end, and he does declare his love for her – lucky Brianna… – but the real hook for Season 5 is another relationship entirely: the one between Murtagh and Jamie. Because no sooner do they all arrive back at River Run than Governor Tryon’s men turn up… to deliver a message to Jamie: first, that he must assemble an army to fight The Regulators rebelling against him, and second, that his first task is to find and kill the outlaw known as Murtagh. 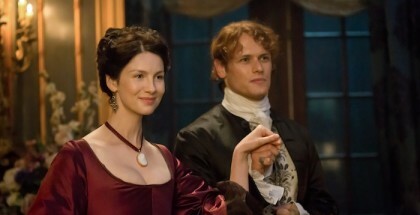 Do we want another season all about Roger and Brianna? Not really. 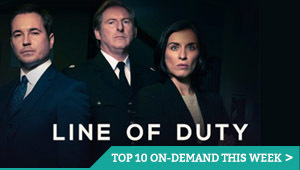 Do we want a season about Jamie and Murtagh being forced to go head to head, while Claire and Lord John agonisingly look on? Absolutely. Here’s hoping that, now Claire and Jamie are back together and the focus has moved on from Roger’s suffering, Season 5 is headed in a more promising new direction. Because let’s face it, we can’t count on Lord John to keep turning up and smoothing over the plot cracks.